Colonel John Ketcham 1782-1865 Col. John Ketcham, founding father of Brownstown, gained both fame and fortune from his Indian hunting escapades performed as a young man in this very area. His father was the hero of a hair raising adventure as an Indian captive. Col. John accumulated titles during his lifetime that yet today make any man envious of his reputation. Among them were colonel, judge honorable (from serving the State Legislature), and he was also a self-taught surveyor and building contractor. One of his most highly prized titles, however, was that of one of Gen. Andrew Jackson's electors. He also was listed as one of the first trustees of Indiana University. The Ketcham family can trace its history back to 1590 when the original Edward Ketcham was born in England. He emigrated to America in 1629 and the Ketchams remained in the East until a great grandson of Edward, Daniel Ketcham, came to the West in 1784, settling in Shelby Co., Ky. Daniel was the father of Col. John Ketcham and eight other children. John was two years old when his father made the trip to Kentucky and has mentioned the journey in his memoirs. He was said to have told his story about the trip: "When coming down the Ohio river on a raft, a wildcat was spotted on a tree branch over-hanging the river, was shot and it fell before me on the boat." Though John's father was presented with 1400 acres of land by the government in Shelby County, Ky., things were not to be easy for him and his family. In 1792, Daniel was carried away by a band of Tawa (Ottawa) Indians who led him on a march lasting several days. The Indians forced Daniel to many hardships carrying full pack while marching through the wilds and fording rivers. After several days of this, Daniel pretended to be injured and began limping. The Indians relieved him of his pack and he proceeded easier. However, while crossing a log bridge, he ran and forgot to hobble. The Indians noticed and immediately loaded him with all he could bear. Eventually the group came to a large camp near Detroit. Daniel was kept prisoner until, one day, the Indians led him to a stake where a fire had been prepared. He was blackened and made ready to die in the fire when an Indian maiden decorated with "fully 500 silver broaches," came forth, denounced the group and took the man to herself. She cared for him until later, he was able to escape the tribe and made his way into Canada, then back to his original home in Maryland. Finally he was able to return to Kentucky. It was said his wife and family there never had given up hope for his return. His wife, when he had been captured, kept the neighbors from pursuing the Indian group lest Daniel be the victim of a tomahawk death, for she believed that God, in His Providence, would bring him back to her. Two years later Daniel returned. In 1803, John Ketcham was married in Kentucky to Elizabeth Pearsy. They had 12 children, six were born in Kentucky and six were born in the Indiana Territory, for in 1811 the family traveled to Indiana and settled in Jackson County, very near to the property that later John sold to the county. The area still was overrun with Indians, some of whom professed friendliness. But most of them were unhappy over the constant pushing westward and northward they were receiving by the signing of treaties with the white men. 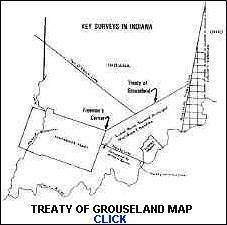 The Ten O'Clock Treaty, signed in 1809, and the Treaty of Grouseland, signed in 1805, formed a perfect triangular boundary, of which this area was in the southern most part. With forts in Vincennes, Terre Haute and Fort Wayne, the area was not particularly well guarded. But, eventually the Indians were to be forced from it. During the period from 1809 through 1818, Indian fighting was an everyday occurrence with the few settlers in the area that braved the wild and hostile Indian tribes. Temporary forts were built to allow the hoesteaders to clear and till the soil and find safety at night inside the protecting walls of the forts. They were built on a line south of just south of Vallonia through Brownstown and on toward the east. The Vallonia fort was manned with 100 troops of the territory militia and afforded protection nearby to the other small forts on up the way. Ketcham's Fort was located on or near the spot where the Asher Woodmansee home now stands and was occupied by a few brave families. Only the other fort, Huff's Fort, lay between Ketcham and Vallonia all that time. Col. Ketcham became one of the fiercest Indian fighters in this area of the Indiana Territory. Some of his escapades are well worth retelling here, most of the information coming from memoirs that the colonel wrote himself a few years before his death in 1865. Most of the action took place during the years of 1812-1813. 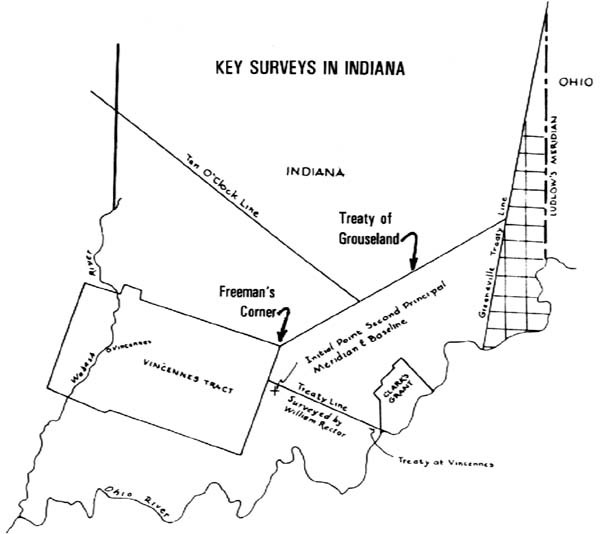 The troubled area as he put it, was in that portion of the Indiana Territory, commonly called the "Forks," situated between the Muscatatuck and Driftwood fork of the White River. The Indians were numerous and friendly in that area before the Tippecanoe battle in 1811. However, the Delaware tribe expressed disapproval of the battle and and many left the territory then, but several remained, enough that white settlers were not without fear. Constant harassment was given the white settlers with occasional murder and horse thievery being committed by the Indians, but no large battles with the whites. In April, 1812, Ketcham recalled a white man was murdered near Ketcham's fort and the colonel and another man retrieved the body, found stripped and thrown in the river. The next day, three Indians came to Ketcham's door. They could speak pretty good English, and the colonel asked them what was new. They replied, "None." Ketcham asked them to accompany him to the site of the murder. They agreed. However, Ketcham's wife begged him not to go with them as did his children. When they had gotten a mile or so away, the Indians said they would go no farther as it would make the white men mad. So they returned to Ketcham's place to find his wife and children had vanished. They had expected an ambush from the Indians and had hidden in the forest. When some other white men saw the Indians they drove them off. About 10 days afterward, there came two Indians with white flags and a note from the Delaware tribe that the trouble had been caused by the Kickapoo tribe, and was not the Delaware. The two Indian messengers stayed on in the fort working for the white men after the peaceful settlement. There were nearly 70 families in the forts at that time, but, after several more murders, about 50 families left and went back to Kentucky to safer territory. The balance of 15 or 18 families were determined not to leave and had built blockhouses for protection. For a time, life continued unchanged, with the Indians stealing horses from within 15 steps of the white men and ambushing the settlers at every chance. On one occasion, the Indians had slipped into the white man's camp and stole some horses. Upon being discovered the settlers gave pursuit to the fleeing Indians and John Ketcham, while directing the chase, was shot. Shortly after this episode, he enlisted for two years in the territory militia. He fought under Gen. John Tipton and participated in many Indian battles, including the one on Tipton's Island, which got its name from the Indian fights there with Tipton's men. Ketcham killed and scalped an Indian on his first trip out with the troops and became at once to be known as a brave Indian fighter. He was carried on the muster roll as First Sergeant. On one campaign he was away from home for 88 days and lived on a week's simple rations. He was a ranger in the militia and received a dollar a day in pay, "sustaining himself" as he put it, which meant finding his own food to eat and clothes to wear. After Gen. Tipton's rough treatment of the Indians at the battle of Tipton's Island, Ketcham said, the Indians retreated and were more wary of their new neighbors. 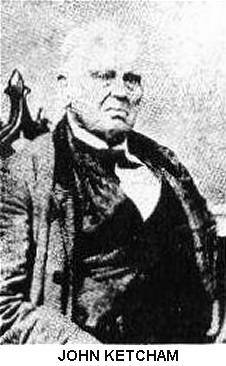 Ketcham was released from the service in 1815 and returned to his home in Jackson County. Two humorous tales he told about his service concerned fording a creek on horseback. The creek was flooded and difficult to cross. He and his friend's horses became mired and stuck fast in the mud. The friend, Jack Storm, had his name attached to the creek and it remains so to this day as Jack's Defeat in Monroe County. The stream empties into Beanblossom creek, which also got its name from a man named Beanblossom who, while riding with General Tipton, almost drowned while crossing the stream. Tipton named the creek Beanblossom which is very familiar to everyone who has been to Brown County. After Ketcham's discharge from the service, he was honored by Gov. William Henry Harrison with rank of colonel in a regiment of the state's militia. He also was presented a tract of land and named one of General Andrew Jackson's electors for 1836 Presidential election. In 1816, before he left Jackson county, he sold to the county government 153.4 acres of ground for 8 dollars per acre, donating the block of land where the Jackson County courthouse now stands for as long as it was used for a courthouse. He also helped lay out the town of Brownstown, the location of which was picked because of its central geographical location in the county. In 1818, Col. Ketcham moved to Monroe County, six or seven miles from Bloomington near Ellettsville. He built a grist mill on Clear Creek the first year and became known far and wide for his service. When the city of Bloomington was laid out in 1818, Ketcham was asked to design and contract for building of the first courthouse there. He became known for his kindness and generosity, and was said to never have turned down a request from a poor family member or traveler at his door. He was elected to the Indiana Legislature, received a judgeship from General Harrison, was appointed a trustee of the Indiana Seminary, and served as colonel in the Twentieth Regiment of the state militia. He also established the Ketcham cemetery in Bloomington where today his remains are buried. He and a co-worker establish a Methodist religious school on grounds at the south end of College Avenue in Bloomington. It was a frame building 30 by 60 feet and later enlarged. It could be said that he was the first trustee of Indiana University, then Indiana Seminary and the Indiana Pioneer Historical Society lists him that way. A chapel was built on the I.U. campus totally financed by the official I.U. chaplain, F.O. Beck and his wife, Daisy Ketcham Beck. Stone used in the building was quarried from Col. John's original farm to make the project more realistic.